Friday, the 29th of September, 1654. Saturday, the 30th of September, 1654. RESOLVED, That a Committee be appointed to consider of the Affairs of Scotland; and to prepare, and offer to the Parliament, such Things as they shall think fit, for the further Consideration of the House: With Power to send for Persons, Papers, Records: Viz. Lord Broghill, Sir Wm. Strickland, Colonel Lilburne, Commissary General Whalley, Lord Lambert, Colonel Lockart, Scout-Master-General Downing, Sir Ja. Macdowell, Sir James Hamilton, Colonel Baines, Colonel Bright, Sir Wm. Boteler, Lord Richard Cromwell, Lord Commissioner Widdrington, Captain Howard, All the Gentlemen that serve for Scotland, Mr. Recorder, Colonel Venables, Colonel Lascells, Mr. Strickland, Mr. Wm. Fenwick, Mr. Barnard, Sir Robert Fenwick, Major Morgan, Mr. Smyth, Mr. Lilburne, Colonel Fines, Mr. Lechmere, Colonel Ireland, Mr. Lermer, Lord Eures, Mr. Wm. Thompson, Mr. John Thomson, Major Peke, Sir Charles Wolsley, Sir Anthony Ashley Cooper, Earl of Stamford, Sir Wm. Doyly, Mr. Turner, Mr. Stephens, Mr. Fluckett, Mr. Trenchard, Mr. Swynton, Mr. Boys, Mr. Brisco, Mr. Sam. Disbrow, Colonel Purefoy, Sir John Temple, Colonel Hill, Colonel Wastell, Colonel Bethell, Colonel Wood, Colonel Cox, General Disbrow, Mr. Walter Strickland, Colonel FitzJames, Sir Robert King, Colonel Mackworth, Mr. Brussey, Mr. Hooper, Mr. Lister, Mr. Lucy, Mr. Minors, Mr. Badger, Lord Commissioner Whitelock; All that serve for the Four Northern Counties: And all that come to have Voices: And this Committee are to meet on Monday in the Afternoon, at Two of the Clock, in the Painted Chamber. Ordered, That this Committee do also take into Consideration the Ordinances which have passed touching Scotland; and to present what they think fit to the House. 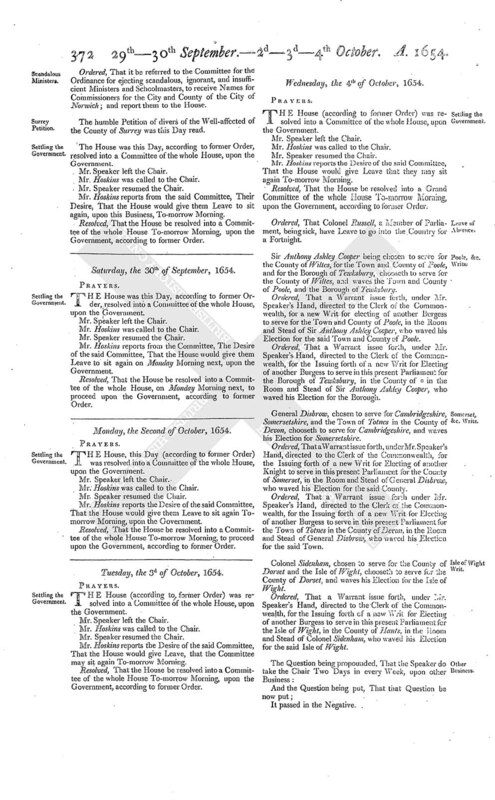 Ordered, That a Committee be appointed, to consider of the Affairs of Ireland; and such Acts, Orders, and Ordinances, as have been made touching the same; and to prepare and present to the House, what they shall conceive fit for the Settlement and Good of that Country: With Power to send for Persons, Papers, and Records: Viz. Lord Broghill, Sir John Temple, Colonel Jephson, Major Morgan, Commissary General Whalley, Mr. Lechmere, Lord Richard Cromwell, Mr. Serjeant Glyn, Sir Robert King, Colonel Clerk, Sir Wm. Doyley, Mr. Turner, Sir John Temple, Sir Richard Onslow, Mr. Hoskins, Sir Charles Wolsley, Colonel Bridges, Colonel Fines, Sir Gilbert Pickering, Lord Lambert, Sir Wm. Strickland, Mr. John Ash, Sir John Hobart, Mr. Recorder, Colonel Jones, Sir Richard Lucy, Major Peke, Colonel Mackworth, Mr. Pury, Mr. Nicholls, Mr. Ellis, Mr. Bryan, Colonel Ireland, Mr. Collins, Alderman Walley, Alderman Avery, Mr. Flud, Colonel Lockart, Mr. Dunch, Mr. Hooper, Mr. Foxwist, Major Saunders, Mr. Stephens, Colonel Lilburne, Mr. James Whitelock, Major-General Skippon, Sir Henry Vane, Mr. Standish, Lieutenant-Colonel Mathewes, Colonel Carter, Mr. Recorder, Colonel Cox, Mr. Fryer, Colonel Chadwick, Lord Henry Cromwell, Mr. Whitway, Jenkin Lloyd, Mr. Harrington, Colonel Carter, Colonel Crowne, Sir Antho. Ashley Cooper, Lord Dacres, Mr. Garland, Lieutenant-Colonel Worsley, All that serve for Ireland, Mr. Shelley, All that serve for Wales, Sir Richard Lucy, Colonel Barksted, Scout-Master-General Downing, Mr. Swynton, Sir John Witterong, Colonel Montague, Mr. Gorges, Sir James Macdowell, Colonel Bridges, Mr. Boys, Colonel Kelsey, Colonel Purefoy, Lord Herbert, Lieutenant-Colonel Mackworth, Mr. Gibbons, Mr. Vaughan, Colonel Harvey, Mr. Launce, Colonel Fitz-James: And all that come to have Voices: And are to meet in the Room within the late Lords House, on Monday next, at Two of Clock in the Afternoon. Ordered, That the Earl of Clanrickard have Leave to stay in England for Six Months now next coming, under the same Benefit and Privilege as he had by his Articles. 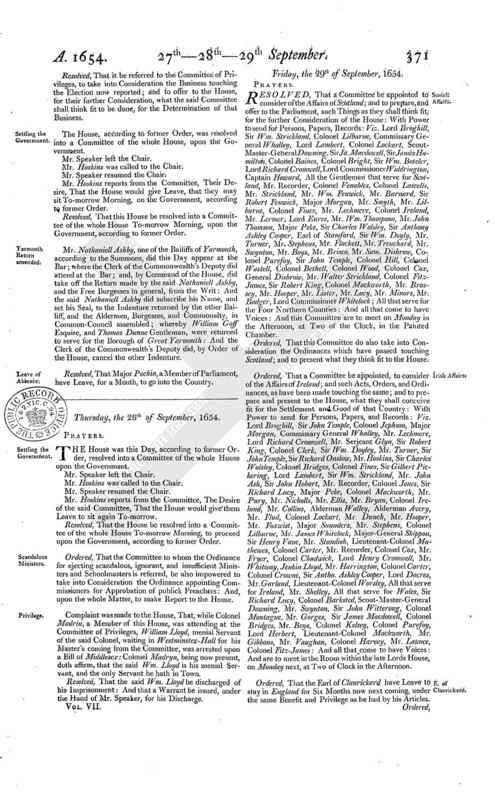 Ordered, That it be referred to the Committee for the Ordinance for ejecting scandalous, ignorant, and insufficient Ministers and Schoolmasters, to receive Names for Commissioners for the City and County of the City of Norwich; and report them to the House. The humble Petition of divers of the Well-affected of the County of Surrey was this Day read. The House was this Day, according to former Order, resolved into a Committee of the whole House, upon the Government. Mr. Speaker left the Chair. Mr. Hoskins was called to the Chair. Mr. Speaker resumed the Chair. Mr. Hoskins reports from the said Committee, Their Desire, That the House would give them Leave to sit again, upon this Business, To-morrow Morning. Resolved, That the House be resolved into a Committee of the whole House To-morrow Morning, upon the Government, according to former Order. Mr. Hoskins reports from the Committee, The Desire of the said Committee, That the House would give them Leave to sit again on Monday Morning next, upon the Government. Resolved, That the House be resolved into a Committee of the whole House, on Monday Morning next, to proceed upon the Government, according to former Order.